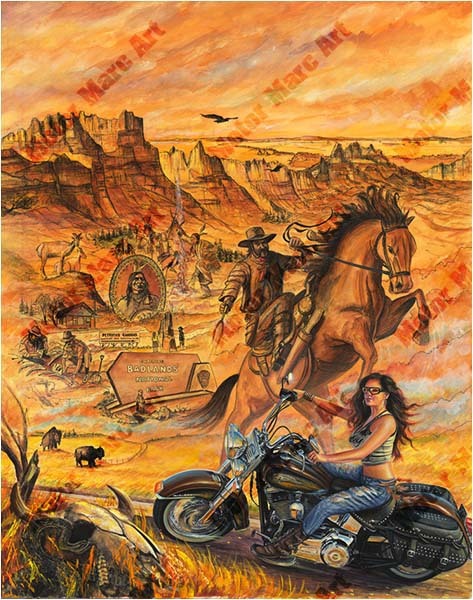 Media Size Choose an option16" x 40 1/2"19 1/2" x 49 3/4"23 3/4" x 60"
Stop by and pay Motor Marc a visit at the Black Hills Harley Davidson Dealership in Rapid City, and view his enormous (12′ by 31′) outdoor art mural at the Sturgis Motorcycle Museum and Hall Of Fame. Prints also available at the Buffalo Chip. Be sure to check out his new releases and show specials, or ask him about his one-of-kind commission pieces. 75 years of history expressed through Motor Marc’s panoramic masterpiece which took 6 years to create. Soaring like an eagle, while grasping the road under their grip, Legend Riders thunder into the western South Dakota where sky-piercing granite peaks and forested mountains dominate. Legend Riders’ journey begins with the touring of epic Mt. Rushmore. 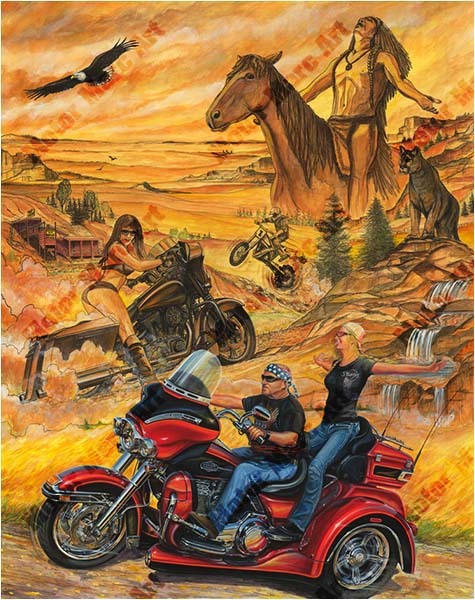 They then embrace the greatness of this nation as they travel to the scenic Iron Mountain Roads and into the roaming buffalo fields of Custer State Park. Through this path riders find wildlife, pigtail bridges, the magnificent Black Hills and tunnels that frame breathtaking mountains. The golden grasses then lead them to gold mining legends where they find their own treasures. The journey continues on to Crazy Horse Memorial which honours the culture, tradition and living heritage of North American Indians? natives? As the men and women continue on this path, they embrace the heritage that surrounds them with the 1880 train rails which glide over the rugged landscape. 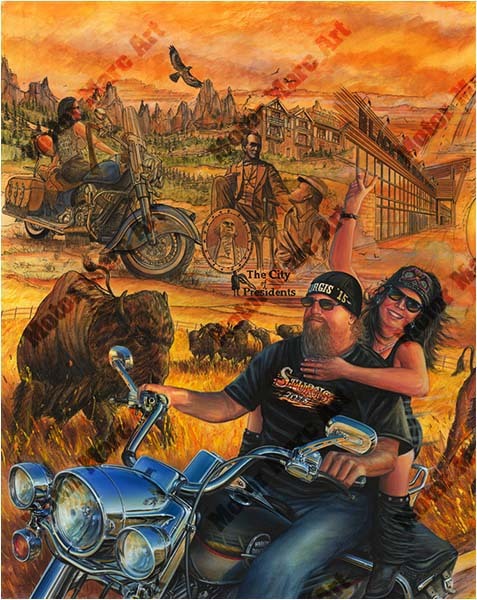 The riders continue on while commemorating the biggest motorcycle rally in the town of Sturgis, where saloons fill with hungry and thirsty bikers and stars and striped banners fill the streets as they honour the war veterans. During this soul searching quest, riders are met by locals who are genuinely friendly and welcome them to the Buffalo Chip; a place where music legends entertain the crowds and bright camp fires light the night sky. 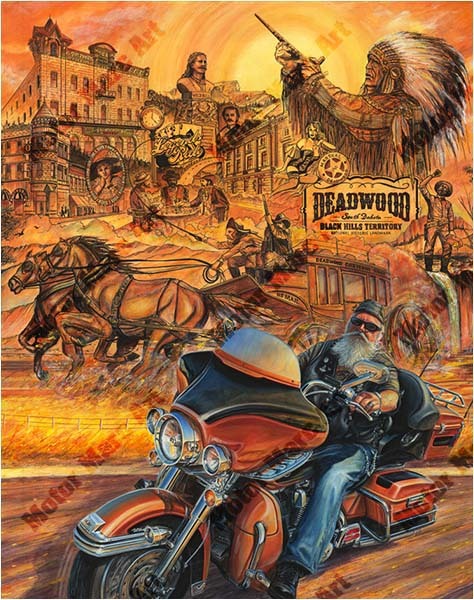 As dawn approaches, riders carve a dusty path through to the historically preserved gambling town of DeadWood, where legends have left their legacy in Mt Moriah Cemetery. Legendary characters like Wild Bill (James Butler) Hickok, undoubtedly Deadwood’s most famous resident, is known to have poured his whiskey with his left hand, leaving his right free for sudden action. Legend has it that Wild Bill was holding Aces and Eights, when Jack McCall shot him from behind. To this day, a card hand of this kind is known as “the dead man’s hand.” Story is told that the local Sheriff tried to tame the town but the outlaw spirit never died. 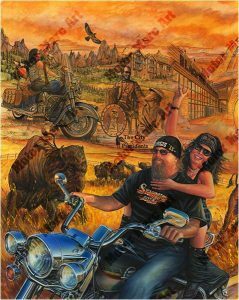 As riders glide along on their custom hogs, the history of the town unfolds. Rich in natural beauty, South Dakota’s Black Hills were the back drop to a whole world of gunslingers, gold miners, and desperados. They follow the path to the Fairmont, one of the most enduring landmarks on Main Street, where they find the infamous Bullock Hotel built in 1895. Centrally pictured are Red Cloud, one of the most important Lakota leaders of the nineteenth century, along with a Crazy horse memorial in far background. Just below you can find Potato Creek Johnny panning for gold with his sluice boxes and rusty pans. The biggest temptation of all for outlaws looking to earn a quick fortune, were the treasure-laden stage coaches such as the Cheyenne Stage Coach, built in 1863. The Black Hills boom was in full swing back then with prosperity at its fullest height. But alas, the country was filled with some of the most noted bandits of that time. 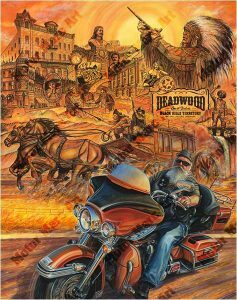 The Wild West is remembered as these Legend Riders travel the winding roads which lead to the Badlands. 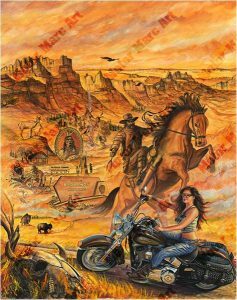 Meanwhile, a gunslinger shoots a deadly rattle snake hidden in a long horn skull, archaeologists dig up petrified bones as buffaloes roam the plains. All set against the backdrop of a jagged-edged mountain ridge. 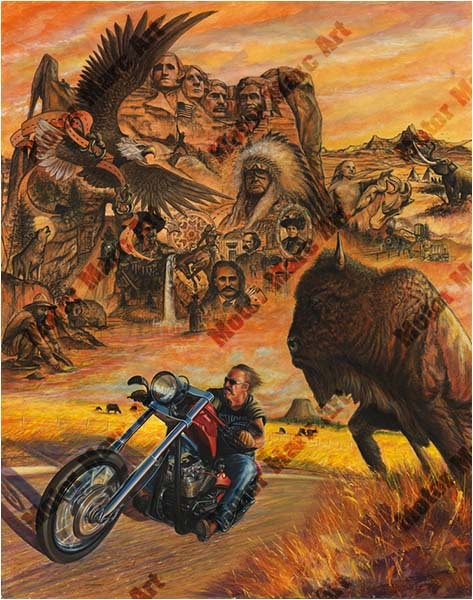 Great Indian Legend spirits roam the earth protecting it’s innocents as the years fly by. Eagles continue to soar above the roads as they change direction and spring waters flow smoother to the new yearly changes of your favourite places, the city of presidents. Motor Marc has captured all of this in one commemorative epic painting which took him on a six year mission to complete. 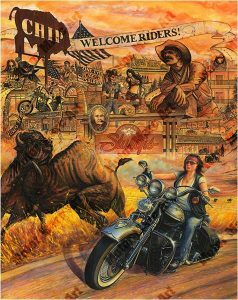 Sturgis Rally embraces men and women from all over the world and encourages them to come together as one large family. These riders were born legends. And as all legends, their legacy is to be upheld with the greatest of honour. They are Sturgis — You are Sturgis — Motor Marc art is truly a part of Sturgis. 16" x 40 1/2", 19 1/2" x 49 3/4", 23 3/4" x 60"